After Bantam hockey I quit playing for a few years. Came back and played "scrub" aka "pickup" with a Friday night group that my dad played with. 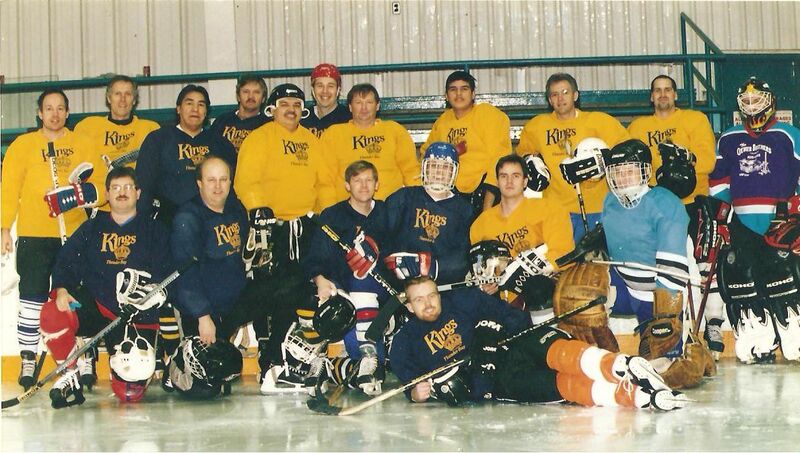 Played as a defenceman for a while then filled in for goal; my dad bought me some 2nd hand goal equipment from a goalie who was retiring and I was a regular goalie with this group for a while. Later I went back to being just a regular player who occasionally filled in at goal. Wearing the old leather deer hair filled pads (Winwell) and the separate and chest (Brown) and arm protectors (Cooper?) along with the old waffle blocker, a Cooper XL7 helmet with a Cooper GL-100L goalie cage, Bauer goalie skates about a 1/2 size too big, etc. Played one semester of high school hockey for Churchill High School. Except for my last 1/2 year of high school I was at Westgate High School. My dad and I tried to get me to play on Churchill's team (who in most games was lucky to have 2 full lines) while still going to Westgate (who had enough players trying out to probably fill 3 or 4 teams). I won't go into all the details here but needless to say I still have some resentment towards Westgate and the SSSAA. In my opinion they were a lot more concerned with the letter of the "law" and not at all concerned with the spirit of the "law". 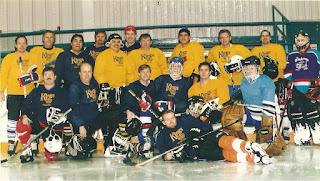 I ended up playing as a winger, which I had never played before in organized hockey. Here's a team pic of Churchill's hockey team scanned from the yearbook from 1987. I'm 2nd row far right. We finished one point out of the playoffs; a win instead of tie in our last game of the season against, I think, F.W.C.I. would have put us in the playoffs. Even if we had made the playoffs we would soon have been toast anyway since the Hammarskjold Vikings were far and away the best team in the league that season. 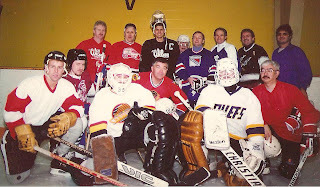 Another pickup group I occasionally filled in for goal and played out in was a Sunday morning group my dad played with. Didn't play with this group a lot because I was and am still not a morning person; though I did enjoy going for breakfast at McDonald's with some of the guys after the game. I am wearing my Churchill jersey in this photo. They played red team against the blue team with the regulars usually staying they usual colours.